Insurance of travel agency against insolvency (bankruptcy). 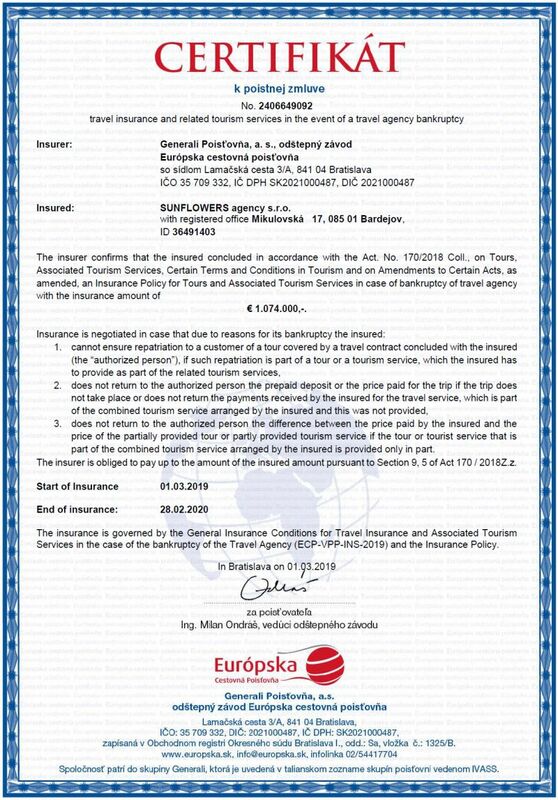 The price of our tours (vacations) includes insurance for the case of insolvency of the travel agency, which is statutory for all travel agencies pursuant to the Act No. 281/2001 Coll. What is insolvency (bankruptcy) of travel agency? The insolvency is a condition when the travel agency spent more financial means than is her profit and is no more able to pay its suppliers for services which it ordered for its clients. If the travel agency fails to acquire necessary funds for its further activity, it is forced to declare bankruptcy. Why is it important for travel agencies to be insured against insolvency? This statutory insurance is a guarantee of certainty and safety of financial means used by you for your holiday. In case the travel agency is forced to declare bankruptcy and you have already paid it for your tour (vacation), you will not lose your money. does not return to the client the difference between the paid price of the tour and the price of partially provided tour in case the tour was performed only partially.